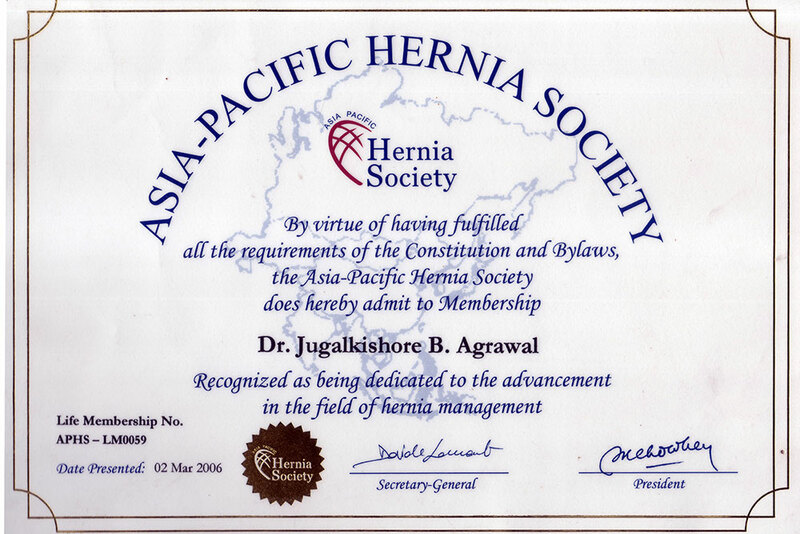 Dr J B Agrawal is perhaps the senior-most experienced laparoscopic surgeon in India today. He has made formidable contributions to develop and popularize laparoscopic surgery in the country. 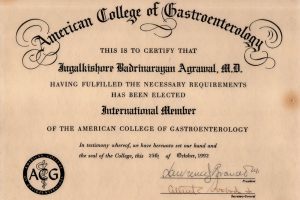 In 1971, Dr. Agrawal obtained his Master’s degree in General Surgery from the University of Bombay with a second rank in the overall merit list. This achievement at the start of his career was an indication of the many milestones he would achieve in the field of surgery. His journey is testament to the fact that he has been a passionate pioneer in bringing the best of treatments modalities and technologies at the earliest for his patients. In 1981, he was the first surgeon in India to use staplers in place of sutures in Gastrointestinal surgery. In 1991 he became the second Indian surgeon to perform a laparoscopic cholecystectomy (gall bladder operation with keyhole surgery). He then powered ahead to become the first surgeon in India to perform Laparoscopic rectopexy (October 1996), Lap splenectomy (March 1995), Lap total extraperitoneal repair of hernia (1996); Lap nephrectomy; Lap gastropexy (1999) and Morgagni hernia surgery (2006). In the 2015 edition of the Limca Book of Records his name was included for laparoscopically removing the largest (9cm) gall stone. Dr Agrawal has performed Laparoscopic and GI surgery on more than 30,000 patients so far. Keen on keeping pace with the times, he has trained in the emerging field of Robotic Surgery and routinely takes on complex GI surgeries that are often refused by others. At present, Dr. J.B. Agrawal is Managing Director of Agrawal Institute of Laparoscopic Surgery, and Consultant GI and Laparoscopic Surgeon at Seven Hills Hospital, Asian Heart Institute & Research Centre, Jaslok Hospital & Research Centre – all in Mumbai. He is the GI and Laparoscopic Surgeon at Bhakti Vedanta Hospital and the M.G. Global BSES Hospital, Mumbai. 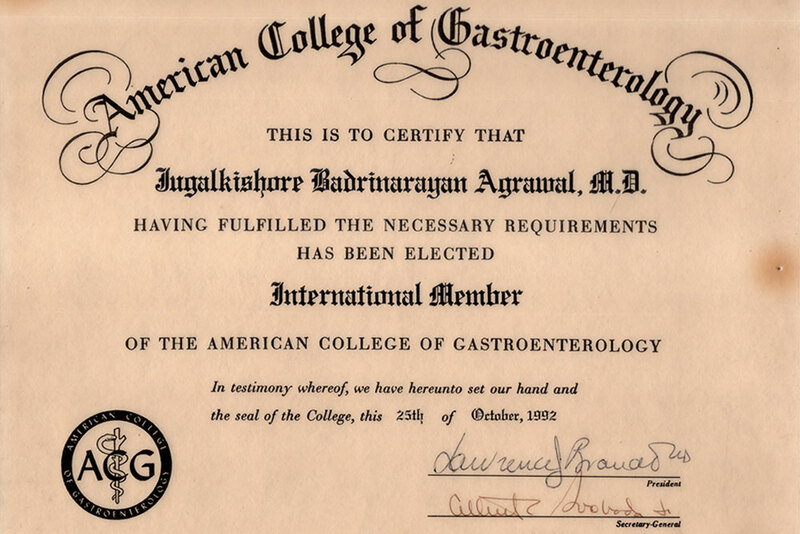 Besides being a top-class surgeon, Dr Agrawal extends his contribution to the medical field as a leading educator. He is a Visiting Faculty at K.E.M. Hospital, Parel, and Faculty Member at the Ethicon Institute of Surgical Education, Mahim and C.I.I. (Covidien Institute of Innovation) Mumbai. He is a chief tutor for Diploma in Laparoscopic surgery of Maharashtra University of Health Sciences (MUHS). 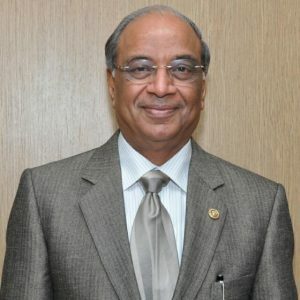 He has conducted over 100 workshops and fellowships to train young surgeons in the skill of laparoscopic surgery He has over 50 scientific papers in various national and international journals to his credit and has participated as Guest Speaker/Panelist/Delegate in nearly 200 national and international medical meetings. He is the current (2017) president of the prestigious Society of Endoscopic and Laparoscopic Surgeons of India (SELSI). In the past he has held the posts of President of Indian Hernia Society and the Maharashtra State chapter of ASI and Founder Secretary of IAGES (Indian Association of Gastrointestinal Endo-Surgeons) to name a few. Through the span of his career, Dr. Agrawal has been focused on furthering science, education and research in the field of Laparoscopic Surgery.